Crews work in 2015 to stabilize a part of Howelsen Hill that was damaged by a spring mudslide. There’s more trouble lurking deep beneath the surface of Howelsen Hill. City officials are reporting new monitoring devices placed inside the city’s historic ski hill have detected movement about 22 feet below tower No. 6 of the Barrows Chairlift. And the shifting earth closer to the hill’s surface has once again knocked the lift tower out of alignment, delaying the opening of the Alpine slide attraction. The unstable lift tower is another headache for the city, which spent $275,000 to realign and stabilize the exact same lift tower after a landslide less than two years. 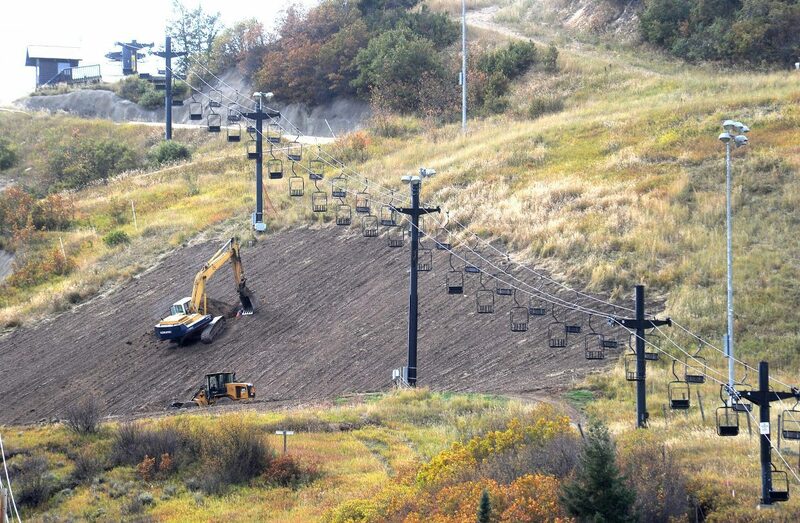 The problem also means lost revenue for the Steamboat Springs Winter Sports Club, which collected about $100,000 in net income from running the Alpine slide in 2014. Winter Sports Club Executive Director Jim Boyne said the slide employs 35 people during the summer and fall. But it cannot run without a lift ferrying people to the top of the hill. “If we open in four weeks, it’s not the end of the world, but we will have staffing issues” if the opening is delayed further, Boyne said. With another six-figure repair bill possible for a tower realignment, the Steamboat Springs City Council is starting to think about a longer term solution. Council members recently directed city staff to start putting out some feelers about obtaining a newer lift to replace the troublesome Barrows lift. They are also hoping Steamboat Ski Area, which has expressed an interest in taking over operations of the ski hill from the city, might be able to help come up with a solution in the future. The directive came after the council learned that important drive train parts for the lift are now obsolete and it might be impossible to track down replacement parts for in the future. Council President Walter Magill and others in the room lamented the city had just missed an opportunity to possibly acquire the old Elkhead lift that was replaced at Steamboat Ski Area. Council members said the data from the ongoing soil study would allow the city to find a more stable path up the hill for a new chairlift. And Boyne said he thinks a new chairlift, coupled with a renewed vision for Howelsen Hill and its preservation, is something the club, donors and the community could get behind in the future. Meanwhile, city officials are looking into whether there was any warranty associated with the previous lift tower repair and stabilization work that might save the city some money on a future fix. But Robinson suggested the problem that is being detected might go deeper than the last repair. City Manager Gary Suiter said Tuesday night some of the earth around the base of the tower has shifted as much as two feet, causing the tower itself to move a few inches. Rising water tables in the area are preventing any heavy machinery from making it up the hill to conduct repairs. Suiter told the City Council the city had been told earlier Tuesday that under the best-case scenario, repairs to the tower couldn’t commence for another three to four weeks. But he said a chairlift contractor has since floated the possibility of some adjustments being made sooner that could get the cable at the top of the tower back in alignment without moving the tower itself. Any repair or adjustment would still need to be OK’d by the Tramway Safety Board to ensure the lift’s safety, Suiter said. “We’re finding more information out every day,” Suiter said.